Support Your Thyroid Condition Naturally! 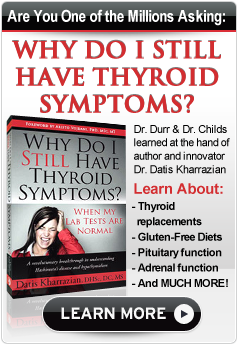 Have you consistently tested negative for Thyroid issues but continue to experience symptoms? If you suffer from any of the above symptoms or are taking medicines and your labs are normal and you still feel lousy put your name and email in the below box to receive our Free Thyroid Report and information about how you can receive our Free Natural Thyroid Relief Consultation. Note: Many of the patients we help are not only from the Chester County area, but also from other outlying areas because if you are a candidate for our clinic, the natural thyroid office visits are usually ONCE PER SIX WEEKS, reducing transportation requirements to a MINIMUM. Why you are taking thyroid hormones and you still feel lousy. Once the thyroid is stimulated by Thyroid Stimulating Hormone (TSH) from the pituitary, it produces thyroxine (T4) and triiodothyronine (T3) by transporting iodine into the thyroid and by stimulating Thyroid Peroxidase Activity (TPO). TPO is involved in the formation of T4 and T3 as it catalyzes the oxidation of iodine using hydrogen peroxide. The thyroid will produce 94% of the available T4 and 7% of the available T3. As we know, T4 is inactive and T3 is an active thyroid hormone. Therefore, the majority of hormone production at the thyroid is inactive T4. Once the thyroid has produced T4, it is metabolized peripherally from the thyroid into combination T3 hormones by the enzyme 5’ deiodinase, mostly at the liver. Under normal circumstances, about 40% of the available T4 is converted into T3, 20% is converted into reverse T3 (rT3), which is irreversibly inactive, and 20% is converted into T3 sulfate (T3S) and triiodothyroacetic acid (T3AC). T3S and T3AC are inactive thyroid hormones until they circulate into the gastrointestinal tract and are acted upon by intestinal sulfatase into active T3. Gastrointestinal sulfatase activity is dependent upon a healthy gut microflora. Disclaimer: Results may vary per the individual. Results are not typical.